Wood floor refinishing and installation, repair and restoration, custom staining and other hardwood flooring services. How Many Times Can Hardwood Floor Be Sanded and Refinished? One great feature of having hardwood flooring installed in your home is that this flooring material can be sanded or re-surfaced and refinished. This allows you to bring back to life the beauty of your wood flooring after normal wear and tear or damages that can happen over time. But how can you determine whether your hardwood flooring can still be sanded or not? The answer lies in how much wear layer is left on your wood flooring. The thicker the wear layer, the better probability that the floor can still be re-surfaced. 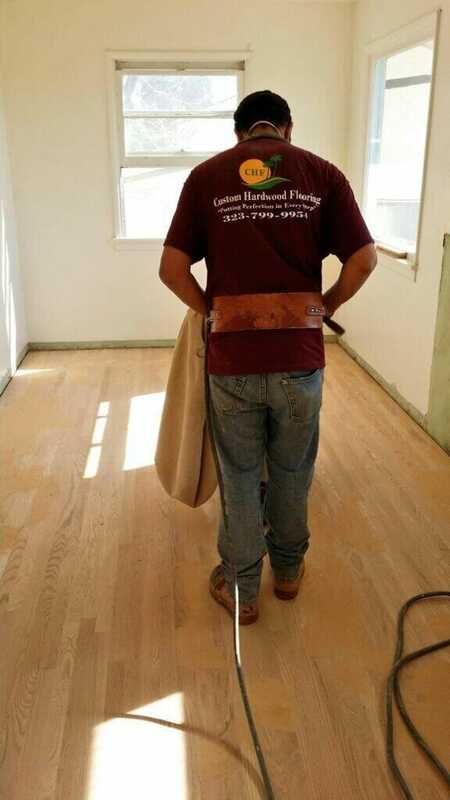 Sanding hardwood floors is the process of taking out scratches, dents and other imperfections in the wood flooring using different levels of coarse sand papers and sanding machine. When done professionally, sanding hardwood floors usually takes away about 1 millimeter of your wood flooring surface. So depending on the thickness of the hardwood flooring wear layer, it can be sanded and refinished. Sanding and refinishing solid hardwood floors is the most ideal. It can be sanded around six to seven times in the course of the wood flooring's lifetime. 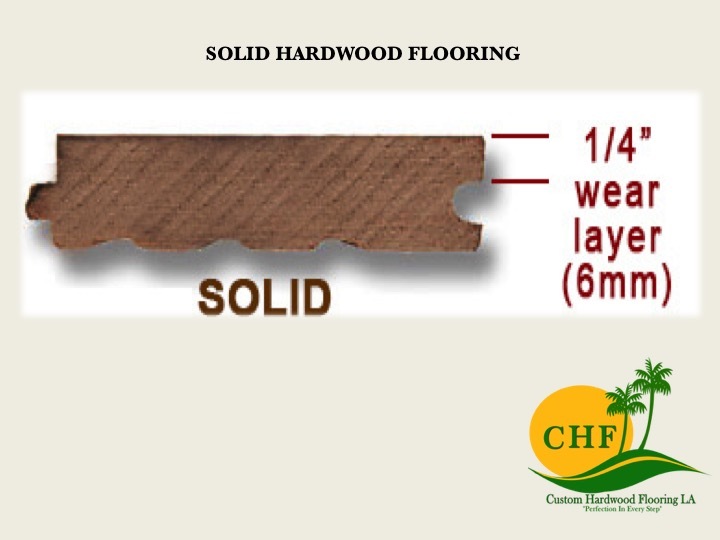 A good solid hardwood floor's wear layer usually starts at 6mm thick. Do take note that sanding the wood flooring's surface would smoothen and even out the top layer. Distressed hardwood floors usually requires hand sanding which is more labor intensive and time consuming therefore more costly compared to a regular sanding and refinishing work. Sanding and refinishing engineered hardwood floors - The quality of engineered hardwood floors is usually determined by how thick the wear layer it has. 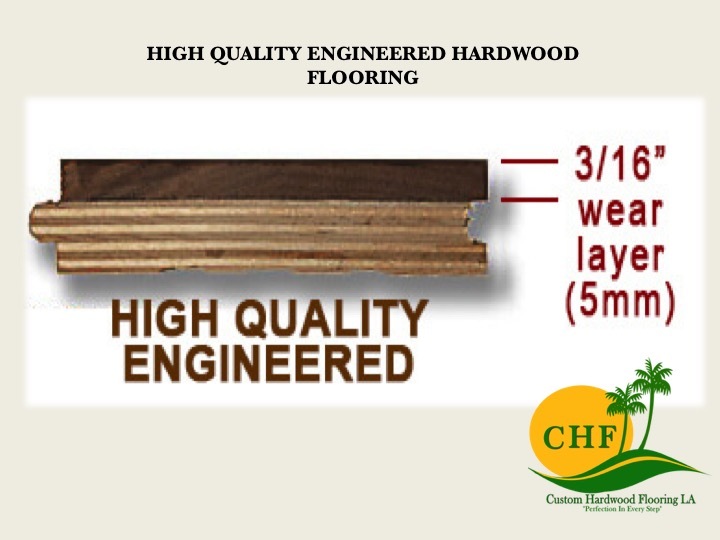 Some engineered hardwood floors can be cheaper in price but have too thin of a wear layer. 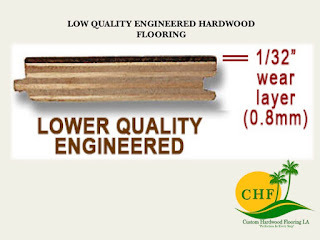 Having their best interest of our clients in mind, the minimum requirement for us to install an engineered flooring for a clients is at least 3mm. This is to make sure that they get their moneys worth because this will allow at least 3-4 times of sanding. Installing anything less than that will NOT allow the hardwood flooring to be sanded because the wear layer is too thin. If sanded patches of plywood / plank can get exposed and the wood flooring can break. Having hardwood floors are known to increase the value of your home. A simple sanding, staining and refinishing can cost effectively update, the look of your property and take care of any scratches, stain, dents or imperfection on the wood flooring. When done by a professional the process can be very fast and easy. Making sure that the flooring technicians are well experienced, licensed and have your best interest can and will save you from a lot of unnecessary problems. 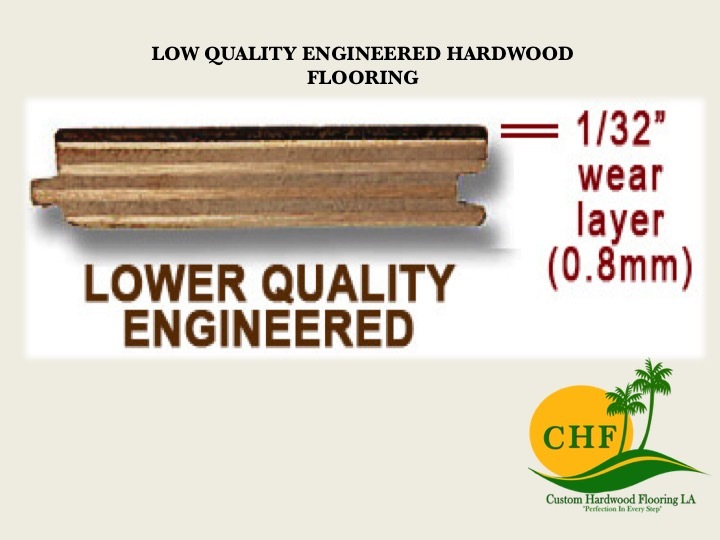 Typically, homeowners tend to overlook the importance of the thickness of the wear layer of the wood flooring. They tend to get hardwood flooring installed base on how cheap they can get it. We know it is a big decision, having new hardwood flooring installed, or refinishing your existing hardwood floors. When you have just begun seeking information, looking into options and ideas, it can be confusing. We have put this blog together to serve as a resource for your hardwood flooring needs, whether you're looking into hardwood floor refinishing or install - and to answer your questions. 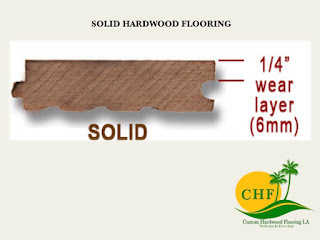 Please search through the blog, and learn about hardwood flooring, hardwood floor installation, different wood options and what type of flooring may work best for you. You can also learn about the hardwood floor refinishing process and how it works. We service all wood flooring needs from work as simple as sanding and refinishing, to repairs and custom installations for residential and commercial properties. We know that you will enjoy your hardwood floors for years to come, as they add so much to a home. WHY CHOOSE US?Professional, quality craftsmanship. We have over 15 years of experience in hardwood flooring. Our prices are among the lowest in the Los Angeles area, providing huge savings to our customers. We stand by all of our bids ~ No hidden charges. 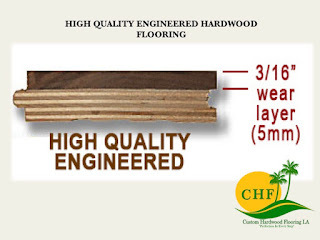 All rights reserved and Copyright by Custom Hardwood Flooring Los Angeles. Awesome Inc. theme. Powered by Blogger.